A friend mentioned to me that she had taken her kids to the botanical gardens. I was instantly intrigued as I'm always looking for any green spots in the Middle East. 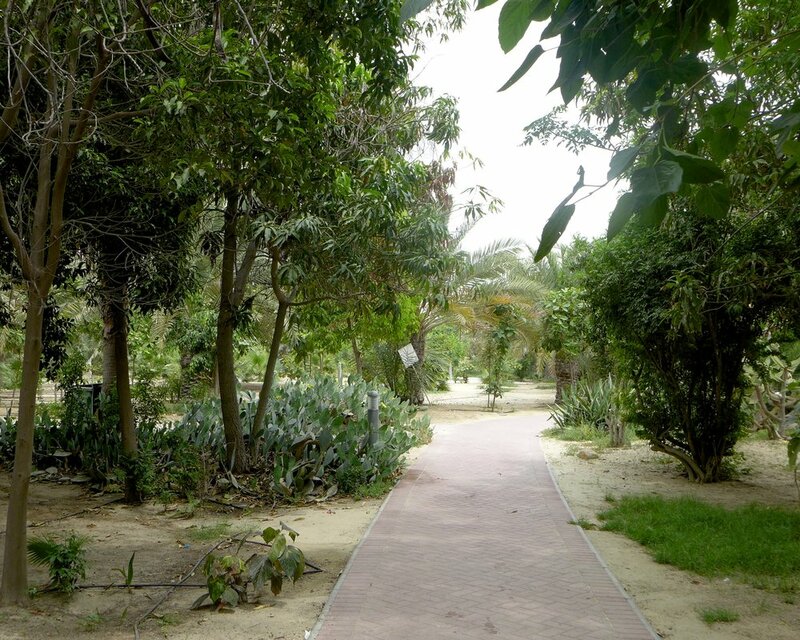 I Googled it and discovered that indeed, there was something called the Budaiya Botanical Gardens/Budaiya Garden just a mere five miles from our house (coords: 26°12'49.9"N 50°27'08.3"E). Who knew? So during my mother's recent visit, knowing that she loves flowers more than anybody, I packed her and the kids into the car one afternoon and we headed out. I had learned that the site of the botanical gardens, was also the location of the annual farmers market, that typically runs from about December to April. Despite being here through the winter, and loving fresh veggies, we actually have not made it to the farmers market yet. It's only open on Saturdays and apparently it is so popular that if you don't get there by 8 AM when it opens, you have to brave intense crowds of people. And no matter how yummy the tomatoes are, we just aren't up for that right now with three little kids. But I knew the general area, so I drove north on Janabiyah Highway and turned left at the intersection of Budaiya Highway. I made my first right into a parking area that seemed to go nowhere. As I was sitting there trying to figure out whether to park or turn around, a security guard approached and I asked if this was the botanical gardens. He muttered something and gestured wildly indicating to go farther down the street. I thanked him and we turned around. I pulled back out onto the road and slowly continued down looking for an entrance or a sign or something. All we came to was a set of locked gates and then the police station. Feeling instantly this was a bust, I know the feeling well, I drove around the traffic circle and put this on my mental "try again" list. At home I searched online but couldn't find any contact information or posted hours, but after talking to my friend I learned that she had visited in the morning. Feeling determined to see this, on our next available morning we repacked everyone in the car and headed back out. This time the second set of gates was open to a larger parking area. Still no sign or posted information, but we grabbed our waters and sun hats and began to wander. I have learned to keep my expectations for green spots low (for added amusement feel free to read about the times I dragged my mother out to the alleged Japanese gardens and wildlife preserve in Kuwait -- she still talks about the irradiated soil park we found). For Westerners though, don't expect Longwood Gardens. 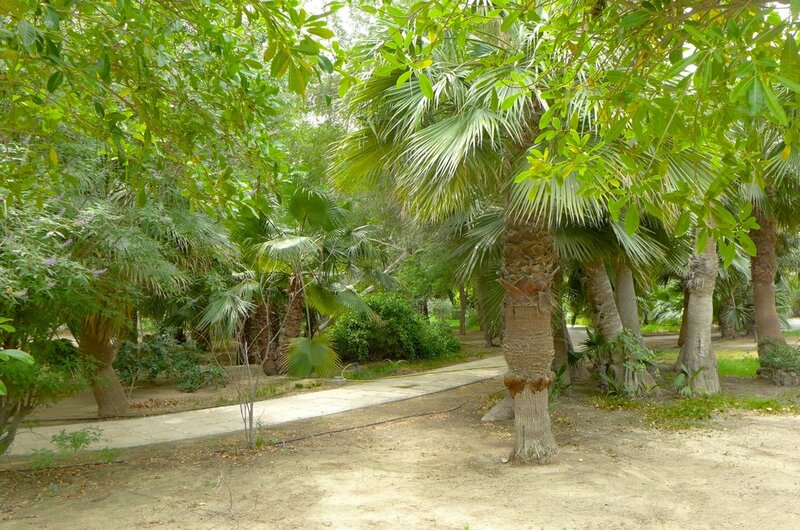 But for what it's worth, the Budaiya Botanical Gardens turned out to be a nice garden with wide walking paths and shade and trees and beautiful flowers. Any place I can let the kids run is a bonus for me, and if you add in shade and nature, it's a triple bonus. We passed by the empty stalls for the farmers market and the empty animal pens. We saw a sign for a lake, so we headed off in that direction. We did discover functional non-horrifying bathrooms, which is always an added plus. After stopping to smell lots of flowers, we came upon a little lake or large pond with a fountain. There were dragonflies everywhere so we stopped in one of the shaded pergolas for a cracker and water break and watched them flit about. Having been restored by the power of carbohydrates, we headed back out into the sun. As we headed back, we decided to follow some different paths. Unfortunately these took us through a more industrial working area past piles of building materials and rubble and maintenance buildings. But we soon found our way back to the trees and flowers. We were amused to see several signs indicating different areas, a rock garden sign leaning against an old palm tree, a rose garden area that could have used a good weeding, and a fruit tree sign surrounded by a lot of sand. I'm not sure what time of year the garden is in its heyday, but we will keep coming back to check and see. As we were loading back up into the car (not an easy feat with three car seats, 100-degree temps, a/c blasting and water refills needed everywhere) a security man approached me. Thanks to the dregs of my baby Arabic, I realized that he was saying we had to pay for the adults. I wasn't entirely certain how much, but gathered together about 600 fils and walked it back over to his little hut. I handed him the money and noted he had nothing but a chair in there. I'm not entirely sure whether there's supposed to be a fee, but if not, I hope he enjoyed a cold bottle of water on us. All in all it was a highly successful outing and will be a spot to revisit.